The last few weeks have been busy ones in our Raptor Hospital, where we have received a variety of sick and injured birds brought in for treatment and attention. Firstly, however, we are very pleased to tell you that our long-term patient “Oily” the kestrel was released this week, along with another kestrel that stayed with us for a period of time after an RTA. It was great to see them both flying off into a beautiful secluded forest where - fingers crossed! - they will both establish territories of their own. But our hospital seems to fill up as soon as it empties and the vacancies left by the kestrels were soon taken by a Tawny Owl with a broken leg, a very damp Little Owl and a dazed & confused young Sparrowhawk - all three casualties of RTA’s. 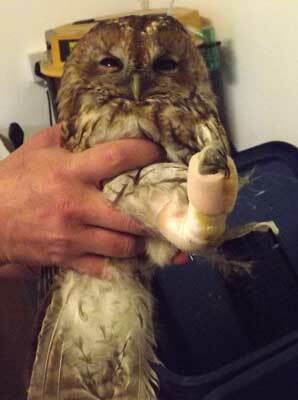 Although on first inspection things looked bleak for the Tawny Owl, who clearly had a broken leg. A trip to our local vet Paul Canning soon revealed that the break was in a very good place and offered the bird a full chance of recovery, so the owl's leg was set in a little cast and he is now resting in our hospital. The Little Owl had apparently flown into the slipstream of a vehicle and had been dashed into the gutter, and so was in a pretty wet, dirty & bloodied state when he first came into us. We believe he would probably have died if he had not picked up, as his plumage was very water-logged and he would have struggled to get dry enough to move himself out of harm's way if left alone in that state. However, after a spell of intensive TLC he dried out enough for him to preen himself clean and once fully healed, will be released near to where he was found. Bloodied but unbowed - and sodden to boot. 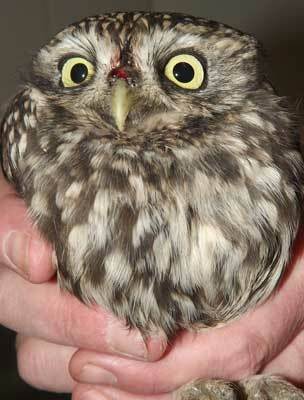 Despite his trying times, after some R&R time to heal, this Little Owl will shortly be back in the wild. Maz holds this sparrowhawk gingerly to avoid the attentions of some vey sharp talons, in full use now he's recovered from the dazed state in which he was found. However I am happy to report the little chap was successfully released this week by the people who found him - we always try where possible to ensure rehabilitated birds are release in the same location they are found, as that's where they have already established a territory. Shortly afterwards the couple who brought him into us sent us a very kind letter, which read: "We released the spar Saturday lunchtime in a field entrance just a few yards from where we picked him up. I’m sorry we failed to take photos we tried but he didn’t come straight out of the box. He sat there for a minute and then was gone in a flash, up & up and soaring around I’m sure he knew where he was. He was very beautiful and I am sure a survivor. Thank you for your help!" Thanks for your good wishes, which are much appreciated. And that's what we're here for.